Finally had my coolant lines fixed and double checking I have no leaks anywhere. 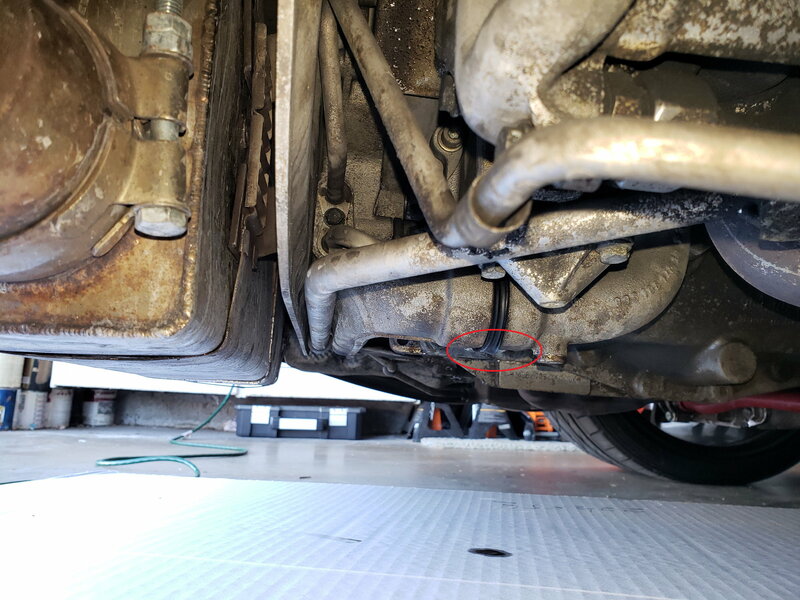 All seems good except for a very minor oil leak (1 drop in 4 days) in the circled area in the photo. Anyone know what that is? Hard to see without a lift. Photo is taken from the passenger side (exhaust can be seen on the left). Look higher. You circled a coolant passage. That's what I was wondering (not an oil line). I suspect it's maybe a drop or two of spillage when topping off the oil. The filler neck is pretty much right above it. I'll take a look tonight if I see anything above it. Could be timing chain cover gasket but I doubt it would magically start leaking because the engine was out. They wouldn't have to mess with that doing coolant lines. rear main seal leaks begin VERY slowly and are actually numbered by porsche in terms of "severity". (1) being you have some time. etc. sorry. thats not the right spot for RMS after seeing the pic again. Yea, way too far back. My guess (hope) is spillage when filling the oil. I used my phone to take a closer look. Everything seems dry. Sprayed some parts cleaner to make sure it's totally clean and will check again after a longer drive; hopefully just a spill. Oil Leak / Vacuum Leak : Does anyone know what part this is? Small Oil Leak - RMS?